Today we are telling you all about a favourite game of ours and we have some very special cards that we play the game with. These cards were got quite a while ago now and we do regularly play with them together. 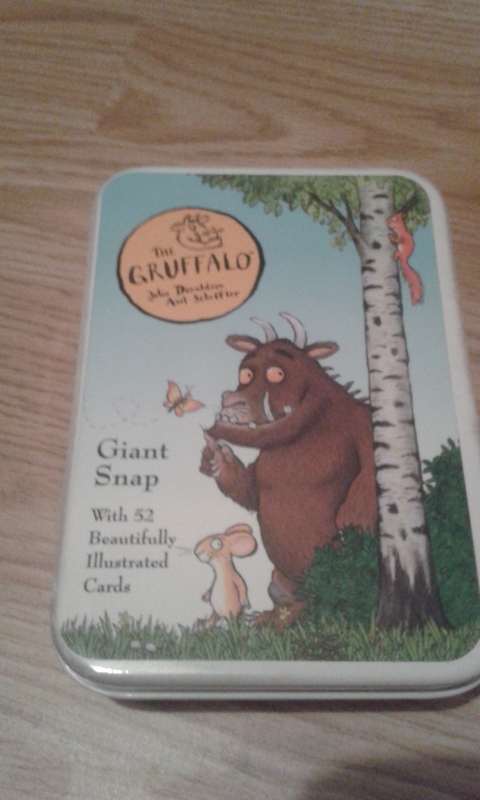 We are going to be reviewing The Gruffalo Giant Snap Cards. We actually got these cards on board a flight to my mum! Which we did before we started blogging and D was too small to use them. I completely forgot about them until a few months ago and they have been a hit ever since! The Gruffalo Giant Snap Cards are a pack of 52 beautiful cards which have characters and quotes from the wonderful book 'The Gruffalo' which is also a favourite of ours! There are 4 of each card in the pack which means there are plenty of chances to get a 'Snap'! The bright colours on the cards also allow for any variations and will help younger children to associate the cards matching each other. The cards come in a beautiful metal box. 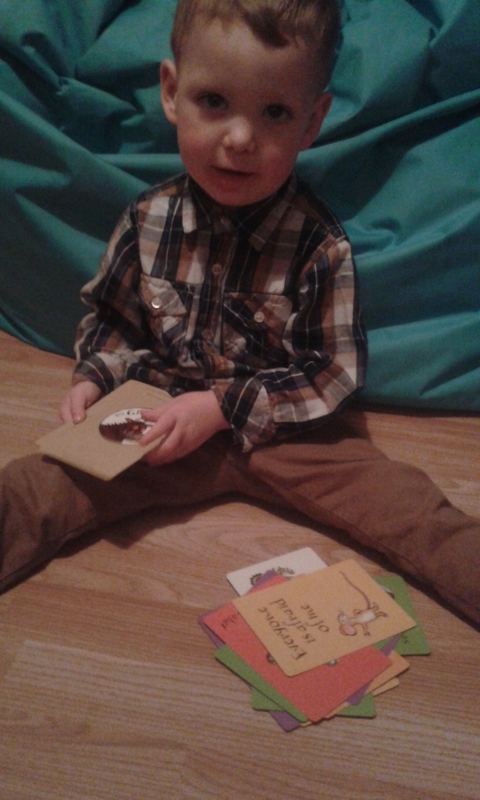 The cards are perfect for children as their size makes them easily handled and gives the child a larger area to grip onto. The cards themselves are a good thickness and that also aids in the picking up and playing with the cards for children. D loves showing me all the picture's and telling me what character it is. He will tell me about the sounds they make which is wonderful as he associates the cards and book. I love how versatile these cards are, we are never just limited to playing snap with them. We can spend an hour or two just playing lots of different games with our cards. We love to play snap, matching game, Guess the colour ( a game where D tries to guess which colour the next card will be ) and we are now trying to teach D how to play 'go fish'. The 'Go Fish' game we are teaching D is a bit different as instead of asking for a specific card we are asking for a colour of a card and D then has to see if he can find a colour in his own cards and if not say 'Go fish'. This game is actually a lot of fun with a toddler and D does seem to enjoy playing any game that involves our snap cards. 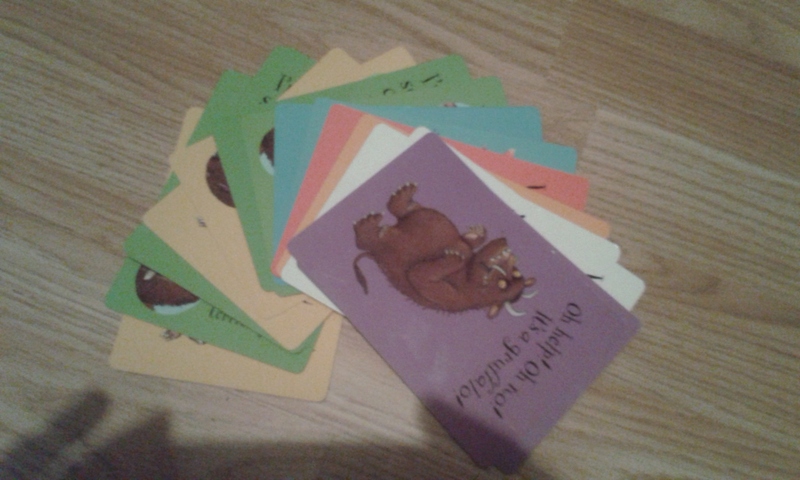 You could also use the cards to spark your child's imagination by shuffling the cards and piling them up before you each choose a card and take turns trying to act out the character's from The Gruffalo that are on your card. I would recommend these cards for anyone looking fun, new ways to engage their child and to play a beautiful game with them. Disclaimer: All thoughts and opinions in this post are my own. 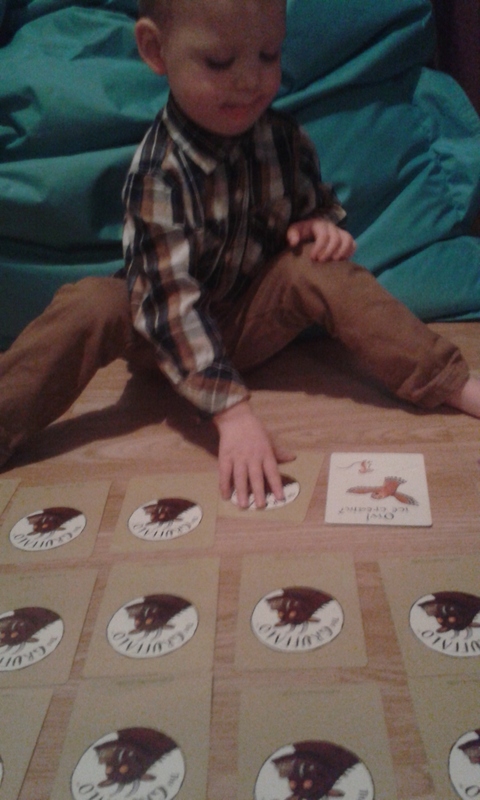 You can purchase your own set of The Gruffalo Giant Snap Cards for £7.95 by clicking the link which leads to The Gruffalo Shop. These cards may also be available from Amazon. These look great! A possible stocking filler for C for Christmas, I think! I think C would love them! They would be the perfect size for a stocking.